According to court filings in Canada, Kevin Hobbs and Lisa Chang, the two co-founders of ICO called EtherParty FUEL and an associated company, Vanbex, based in Vancouver, are allegedly under investigation by the Federal and Serious Organized Crime Division of the RCMP for, inter alia, fraud and are also under investigation by the Canada Revenue Agency for tax offences. 2005 – convicted in the US for possession of 100 pounds of marijuana in an incident in which he also had US$178,000 in cash in a suitcase. 2008 – convicted of possession of proceeds of crime for having $32,000 in cash in heat sealed plastic bags in a suitcase at an Airport and of laundering the proceeds of crime. 2009- convicted in connection with a grow-op operated from a home he was renting and of unlawful possession of marijuana. This month, the Director of Civil Forfeiture of the Ministry of the Attorney General of British Columbia, filed a civil forfeiture action in rem against Kevin Hobbs and Lisa Chang and as against property they own arguing that the property is proceeds of crime. The Notice of Civil Claim appears to suggest that there may be a securities action because the alleged proceeds of crime is alleged to arise from, inter alia, public market activities. Mr. Hobbs and Ms. Chang have since filed a Response to Civil Claim, denying the allegations, which is summarized below. The court documents in British Columbia allege that Mr. Hobbs and Ms. Chang interchangeably under Vanbex, EtherParty and FUEL, represented to investors that the FUEL ICO could be used for smart contracts and would dramatically increase in value, and then they, by “deceit, falsehood and other fraudulent means”, defrauded investors of over $30,000,000 raised. The application alleges that Kevin Hobbs and Lisa Chang used investor funds for their own use. Among other things, they allegedly bought a luxury condo in Vancouver for $4 million and Hobbs allegedly bought one in Toronto for $3.7 million. According to court documents, they also allegedly bought and rented luxury vehicles, including a Lambo. The Toronto condo for $3.7 million was paid for entirely in cash, according to court documents. The court documents state that Kevin Hobbs and Lisa Chang have no known occupation to the government plaintiff. Clearly, though, they have an occupation running Vanbex. The pleadings allege that in two years, Vanbex developed no usable product or service. EtherParty’s tech concept was to create technology to enable anyone to easily create smart contracts. Its white paper is here. 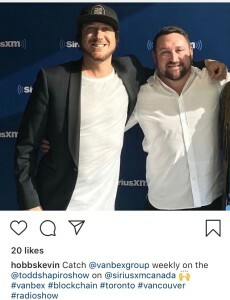 According to court documents, Mr. Hobbs is alleged to have gambled over $1.8 million using the ICO investment funds at a Vancouver casino, and was placed on a “watch list” by the BCLC for buying in with unsourced funds (this usually means, for example, that the person can’t point to a source of funds that satisfies the casino, such as a tax assessment evidencing after-tax employment income of $1.8 million ). According to court documents, when Mr. Hobbs and Ms. Chang realized they were under investigation, they allegedly attempted to liquidate the assets deliberately. An online profile today described Ms. Chang as a real-life hero in the age of crypto. She is credited with working on Tether and also working on Mastercoin, the latter which the article indicates was the first ICO in the world. In the article, Ms. Chang says (in reference to there being no best practices back then and although it is not clear, presumably this means in 2014 and in relation to Mastercoin) that “half of the world thought it was a scam, telling us bluntly that we were going to jail; and then the other half saw this was a brand new way for companies creating open source technology to fundraise.” Not to detract in any way from Ms. Chang - she may have indeed played a material role in the development of ICOs on the global landscape but, PR wise, not an ideal statement. Some of the ICOs Vanbex indicates they worked on include Dash, Factom, Tron and Storj. 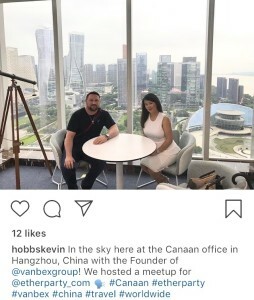 The court filings, however, allege that Mr. Hobbs and Ms. Chang lied (the government’s word) and that Vanbex and its subsidiary companies were shell companies which only ever had two clients. Neither Lisa Chang nor Kevin Hobbs have been charged in connection with this investigation. All that has occurred is that the government has filed a Notice of Civil Claim and two applications to seize their assets and has successfully obtained a seizure order over those assets. All of the statements in the Notice of Civil Claim and Notice of Application(s) are allegations that have not been proven in any court, although there are Affidavits in support thereof. The order is not a mareva injunction, or an order as against the whole world in respect of other of their assets. Mr. Hobbs and Ms. Chang are sharing a lawyer. There does not appear to be counsel yet for Vanbex or for EtherParty or separate counsel for each of Mr. Hobbs and Ms. Chang. That will have to change – they will need separate representation and the corporate entities each need their own lawyers as well. The Vancouver condo, featured below, that was ordered forfeited was bought by Ms. Chang and Mr. Hobbs for $4.1 million in November 2017, was renovated and listed for sale for $7.8 million. According to older court records unrelated to this civil forfeiture action, Mr. Hobbs’ criminal history seems tied to a series of events that occurred during the course of one summer. On balance, he does not appear to have a criminal history, per se, that extended beyond events in 2005, except as alleged now by the government. In March 2005, Mr, Hobbs was placed under police surveillance in Canada. On April 8, 2005, Mr. Hobbs arrived to check in for a last-minute flight and was detained at the Halifax Airport. A police dog at the Airport had made a positive indication of Mr. Hobbs’ suitcase for the presence of drugs. Mr. Hobbs was detained. He denied the police permission to search his suitcase without a warrant, and the police held onto the suitcase to obtain a warrant. Mr. Hobbs was permitted to leave the Airport. The police subsequently obtained a warrant and opened the suitcase in the presence of Mr. Hobbs. Therein, they located $32,000 in cash in heat sealed plastic bags and mostly in denominations of $20 with elastic bands around the bundles of cash. Mr. Hobbs later indicated that the $32,000 was being taken to Vancouver to gamble. There were no drugs in Mr. Hobbs suitcase. However, the heat sealed plastic bags containing the money tested positive for the presence of cocaine, as did the handle of his suitcase and his clothing. Three months after the Airport incident, he went to New York, and on July 28, 2005, he was arrested in a hotel room and found to be in possession, with two other persons – one from Vancouver – of 100 pounds of marijuana and US$178,000 in cash in a suitcase. The drugs and money were forfeited. In New York, Mr. Hobbs pled guilty to criminal possession of marijuana in connection therewith and intimidating a victim or a witness, and received a sentence of one year incarceration. He was credited for time served during remand. A week after the New York hotel incident, police executed a search warrant on a large house rented by Mr. Hobbs and located a grow-op in the basement. The grow-op was described in court documents as semi-sophisticated. Mr. Hobbs was arrested on August 18, 2005, and charged with unlawful possession of property or proceeds of property knowing that part or all of it was derived from an indictable offence (e.g., proceeds of crime) and with dealing in those proceeds with intent to convert the proceeds knowing or believing that all or part of it was derived from the commission of an indictable offence (e.g., money laundering). He was also charged with the grow-op operation and possession of a controlled substance. Mr. Hobbs may not have been present during any of this incident since if appears that he was incarcerated in New York. At his trial, Mr. Hobbs maintained that the $32,000 cash was from casino winnings. The RCMP testified that the money could not be derived from gambling because of the way it was packaged (e.g., wrapped in elastic bands in plastic bags). Mr. Hobbs testified that he was a professional poker player and he was going to gamble with the $32,000 at River Rock Casino, which was having a big poker tournament at that time. A River Rock Casino executive testified that there was no poker tournament scheduled at the time that Mr. Hobbs had deposed. The RCMP testified that, at that time, the money he had in his suitcase was equal to the price of a brick of cocaine and given that his clothing and other items tested positive for cocaine, they suspected he was going to Vancouver to purchase coke and resell it in Halifax. The Judge held that Mr. Hobbs was wholly unreliable in his testimony, making up stuff on the witness stand, and he was convicted by a Judge on the two counts in the indictment (e.g., possession of proceeds of crime and money laundering) and sentenced to 9 months imprisonment. He was convicted by a jury of the unlawful possession of marijuana and operating a grow-up. Mr. Hobbs appealed his convictions many times over several years, one quite successfully and some as a self-represented litigant. In one appeal, the Judge said that he was concerned about Mr. Hobbs re-offending and remarked to Mr. Hobbs that he needed to realize that a quick way of making money has significant risks. There is at least one other litigation in the United States in which Vanbex, and its two co-founders are defendants – for an alleged failure to provide services to a company wanting to do an ICO that pre-paid US$80,000 for a white paper, global marketing and introductions to ICO buyers, none of which allegedly materialized. The defendants have posted an unfiled Response to Civil Claim on its website in which they deny all of the allegations made by the government. Among other things, the defendants say that Vanbex, the corporate entity, did not solicit funds for the FUEL ICO and that, and while its a little vague, that the purchasers thereof were informed of the risks (presumably of investing) into the FUEL ICO, and that such risks were prepared by a lawyer. The Response says that Vanbex currently has 50 employees and many clients, as well as more clients seeking their services currently, which means they have not been harmed by the allegations made by the government. The Response also clarified that Vanbex is a consulting company while EtherParty is an entity that develops technology. The Response states that the Lambo was actually bought, and not leased, as the government alleged and after it was bought, it was sold. With respect to gambling, the Response states that Mr. Hobbs did not use company money to gamble at a casino. The Response dives into how the FUEL ICO was sold online and somewhat into the secondary market sales by its purchasers. The relief sought is to over-turn the forfeiture action. Although the Response does not expressly say so, it is possible that the defendants are objecting to the characterization of FUEL as a securities if such a characterization has been advanced by other parties, on the basis that the Howey Test is not applicable in Canada. There may be some merit to that, if that is what is happening because some lawyers are of the view that one of the four aspects of the test arguably does not apply in Canada.